Nowhere is that more important than on the Atlantic Intracoastal Waterway. As 2016 begins, we at the Atlantic Intracoastal Waterway Association (AIWA) are looking forward to participating in the ongoing dialogue regarding the need for strategic investments in the Nation’s Marine Transportation System. Our organization advocates for the ongoing maintenance of one of the nation’s longest water infrastructure projects, the Atlantic Intracoastal Waterway (AIWW). Although the waterway has received funding for the past few years, we know that more is needed for this vital transportation route. The AIWW serves a number of commercial, governmental and recreational organizations over its’ collective 1,100 mile length. Whether it’s a small town fishing village or a large-scale corporation, the AIWW provides safe transportation to all users all along the eastern seaboard. Today, we see a number of opportunities and threats facing the AIWW. Similar to many other federal projects, we face a lack of consistent and sustainable federal funding to maintain the waterway at its full capability. The AIWW has received incremental increases over the past few years and we are extremely thankful for the effort that has led to those extra dollars. But, we also see an opportunity to invest in the nation’s most efficient mode of transportation with lower emissions, lower costs, and a good environmental safety record. As the harbor deepening projects come to fruition and Post-Panamax ships steadily arrive, the nation must maximize all of the transportation avenues that are available. Just this past November, we were fortunate to have U.S. D.O.T. Maritime Administrator Paul “Chip” Jaenichen participate in our annual meeting. Administrator Jaenichen painted a very clear picture regarding the expected increase in freight movement in the United States by 2040. With an expected increase of over 45% in freight movement, we were left to wonder if existing infrastructure of the multi-modal system could support the anticipated increases. Our view is that our nation has a greater opportunity to manage these increases by investing in the development and maintenance of a reliable national marine transportation system, and more specifically marine highways such as the AIWW (M-95). Moving forward, federal dollars will continue to be constrained for infrastructure needs, and ongoing maintenance will likely require investments by non-federal partners. On the AIWW, non-federal partners have established dedicated funding sources in Florida and North Carolina to aid in keeping their sections of the waterway open. In 2015, Charleston County, South Carolina provided $500,000 to supplement federal funding for waterway maintenance within the county. We fully believe that it should remain a federal responsibility to maintain the nation’s marine transportation system, but there is a willingness to support limited non-federal funding if work can be scheduled and completed in a timely fashion. In 2016, we are focused on pursuing additional funding for the maintenance of the AIWW, and the completion of Section 2008 of the 2014 Water Resources Reform & Development Act (WRRDA 2014). This section required the Corps to conduct an Assessment of Operations and Maintenance Needs for the AIWW and the Gulf Intracoastal Waterway. Upon completion of this study, everyone will have a roadmap showing the needs of each waterway and the necessary dollars to maintain them. Fortunately, the congressional delegation along the waterway supported this effort and now we hope that it will be included in the upcoming budget proposal. With this information, Congress will see the amount of money needed to maintain the waterway, and non-federal partners will see the amount of funding needed to maintain their section. Through these activities, we will continue to move forward in providing what all of the users of the waterway desire, a well-maintained marine highway 95. 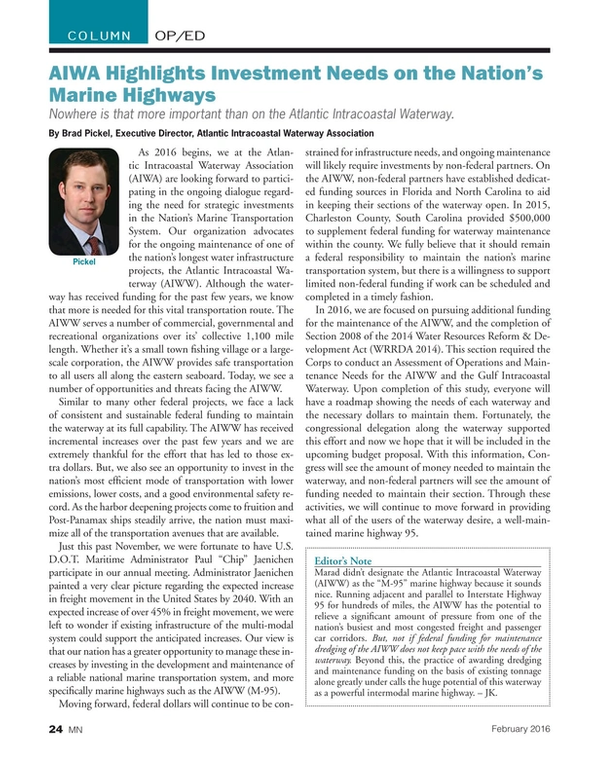 Marad didn’t designate the Atlantic Intracoastal Waterway (AIWW) as the “M-95” marine highway because it sounds nice. Running adjacent and parallel to Interstate Highway 95 for hundreds of miles, the AIWW has the potential to relieve a significant amount of pressure from one of the nation’s busiest and most congested freight and passenger car corridors. But, not if federal funding for maintenance dredging of the AIWW does not keep pace with the needs of the waterway. Beyond this, the practice of awarding dredging and maintenance funding on the basis of existing tonnage alone greatly under calls the huge potential of this waterway as a powerful intermodal marine highway. – JK.